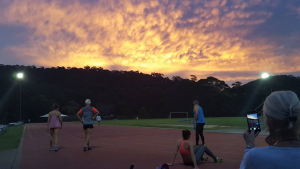 Fast and Fit are based on the beautiful Northern Beaches of Sydney, nestled between the sandy beaches and the rolling hills covered in trees. For variety, we do our training at several locations around the Northern Beaches area. 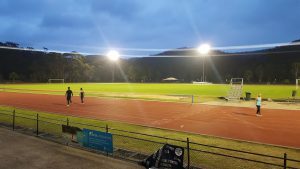 Locations vary from day to day but include Sydney Academy of Sport Athletics Track, various Sand Hills and Flats on the beautiful local beaches or lakes, Grass Hills and long and winding Stairs. Variety is the key to keeping it interesting and at the same time, helping to develop smaller muscle groups not necessarily challenged by a single track environment. 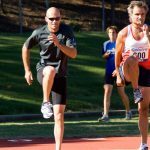 Our Phased Coaching Sessions might mean during the “off season” between competitions, or maybe winter month if you are coaching for fitness rather than sprints, we might be concentrating on an Endurance Phase. In this phase we will build greater strength and fitness. These tend to be longer slower routines during the session. They will push your cardio and lactic thresholds to their limits. These sessions might be performed at the Academy Athletics Track, local grass hills, stairs or beach sand flats and hills. Another phase might be the Peaking Phase for developing the maximum speed immediately prior to a competition. 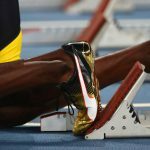 These will typically involve short and faster runs and will probably be performed at the Athletics Track or sand flats. Whatever the period of the year or weather, there is always an exciting and interesting location to work on achieving that goal. We carry out coaching most nights during the week. Come on down and say hi.